I have began to settle into a new neighborhood outside of Paris. I have also made a few new discoveries of the apartment complex I live in. The first week I saw two dragons shapes manifested in the cement textures very close to the gate. This was actually a natural occurence that happened over the years of the elements slowly chipping away at the wall. It made me stop and think but I took no further notice until I realized that in the back yard was an ancient well. 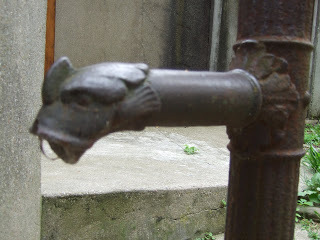 It is not used any longer but a metal serpent’s head was the water spout. At that moment I realized our apartment building was on the underground water system that runs from Saint Cloud Park down to the River Seine just a few kilometers away. But this serpentine story has even one more twist – the Naga Well in the backyard is directly next to the garbage cans of the apartments. 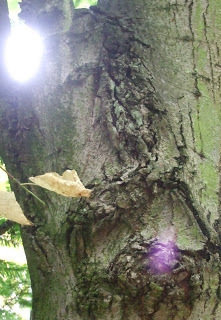 The Outer Nagas were pointing the way to my Inner Nagas to keep purifying the lower emotional body. I just had chuckle of how the Universe manifests if you keep my eyes open. The night after finding the well I had a very powerful dream that actually woke me up. I dreamed I was holding a live serpent. My right hand was over my left side of my pelvis holding his tail. And my left hand was over my heart holding the Naga’s head. The serpent felt like a very strong electrical currant running though my hands. The electrical current felt as if it was coming out the center of my heart. I woke up with my hands in this position. I was fully awake, still experiencing the electrical current running though my hands and in my heart. It felt like holding the ancient healing wand. Something you might see a priestess hold or winged Mercury. I found a painting in this cathedral of Sainte Prudentia. Whose appearance was more like a Goddess then a saint. In the background of Prudentia there was a serpent on her right and a bee hive on her left. The bee hive was an ancient symbol of Venus. But this symbol also had been used by Napoleon. The serpent had been used as the symbol of the Goddess long before the story in the bible of Adam of Eve. The Adam and Eve story represents dualism. 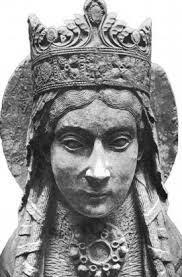 This image of Prudentia was directly below the Christ on the cross with the Mother Mary, Mary Magdalene and Saint John. When I looked closely at this image I saw a bucket of eggs and a bottle of wine that appeared to be offerings for the Naga. The symbol of the serpent is the power of the Kundalini that is dormant in most of humanity. It is the sleeping sexual energy at the base of the spine. When this energy is awakened it is raw power that runs though the spine, initiating the different chakras. Kundalini is sexual power awakened that is used for the initiate’s enlightenment process. But when this power has not been completely dedicated to the Divine, it can become corrupted with human will and human ego. Maybe this is the message of Prudentia, to have prudence, humbleness learn the art of Divine Surrender.